On the way home from our weekend trip to Bhatkal, we stopped by this roadside shop to quench our thirst with sugarcane juice in the outskirts of Bangalore, India. This picture post is shared in Thursday Photo Challenge – For Fun and Learning and in PADE hosted by juztamom for the themes Machines and Tools respectively. Kitni Makhiyan hoti hain. . . Mere ko tau thoda dar hi lagta hai. Wow! Brings back my childhood memories! 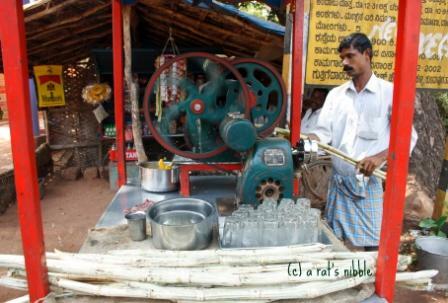 Hey Meera..this sugarcane machine reminded me of my childhood..i used to dring sugarcane juice so much..its yummy! long time i didnt have it..wanna try it very soon.